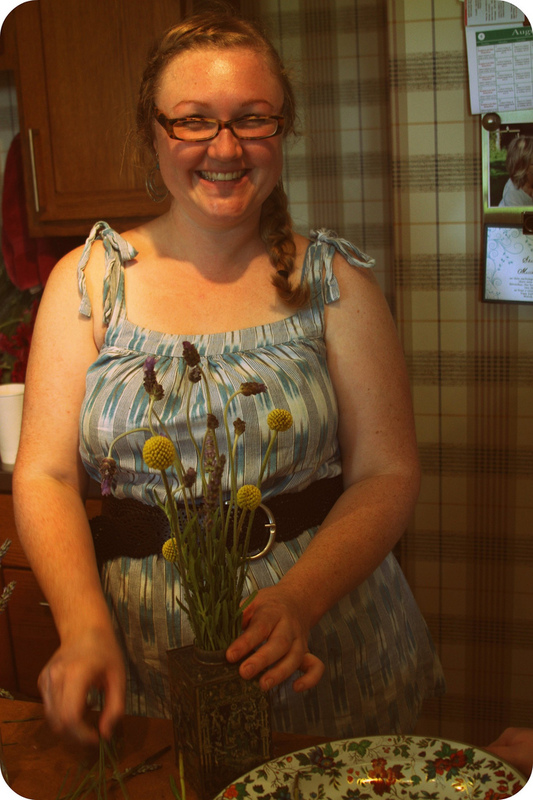 Today, I spent the entire day barefoot, on a farm, surrounded by flowers. Because tomorrow, one of my dear old friends, Jamie, is getting married. This morning, we got together arrange a whole slew of flowers at her auntie and uncle’s farm. 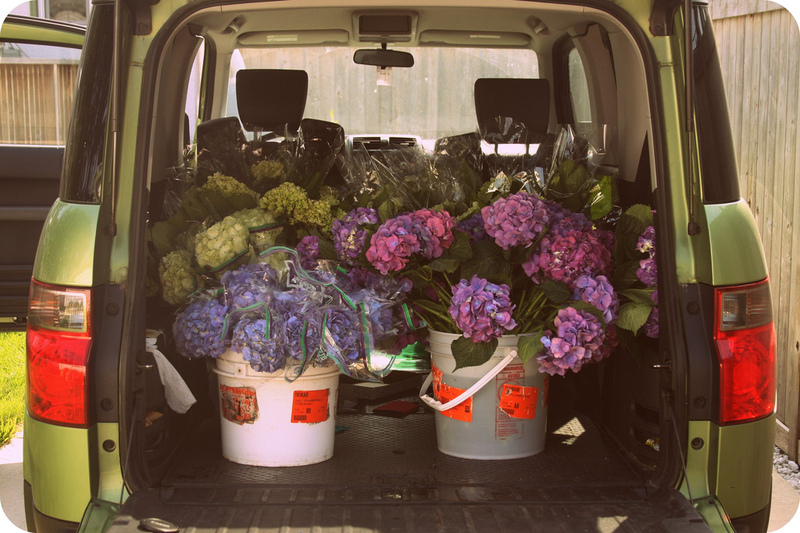 My car was packed to the gills with blooms. It was awesome. The bride-to-be, hard at work. 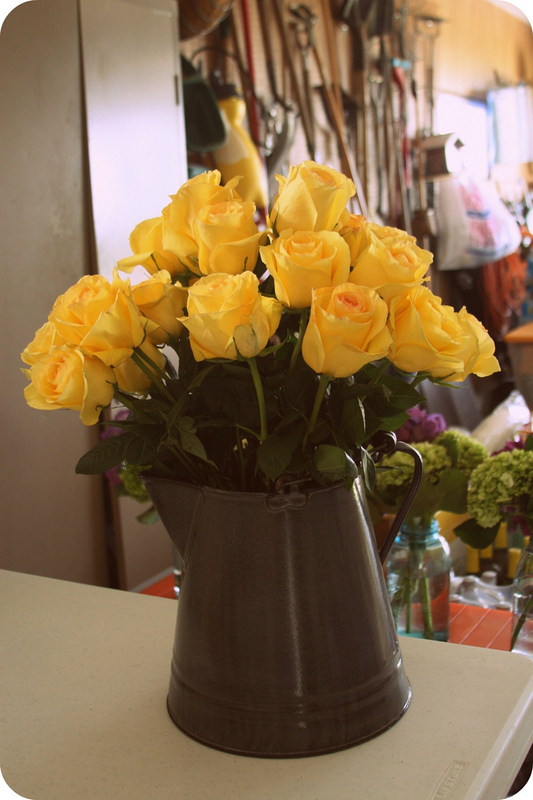 Yellow roses were Jamie’s grandma’s favorite flower, so we made one arrangement in honor of her. They’re so gorgeous! Her aunties and mom rounded up a zillion blue bell jars for the main centerpieces. 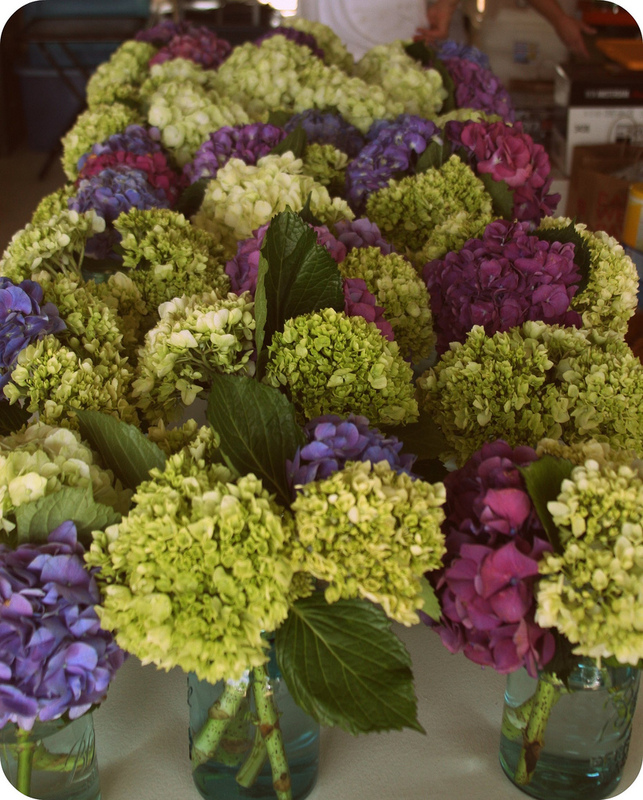 By the time we were done, we had four tables packed with finished arrangements. The tea tins Andrea, Jamie and I thrifted, filled with lavender and cute yellow ball-ish blooms, are too cute. I’ve got to get better pics of them tomorrow, once they’re on the tables. 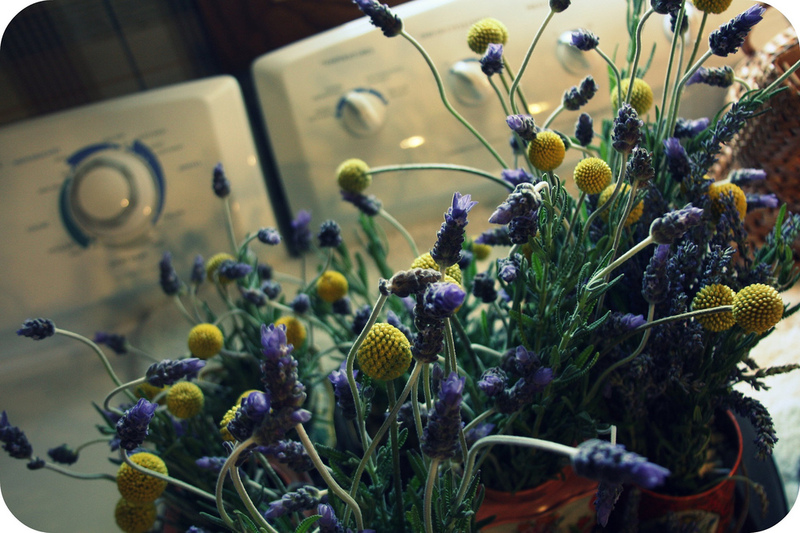 They smell divine. 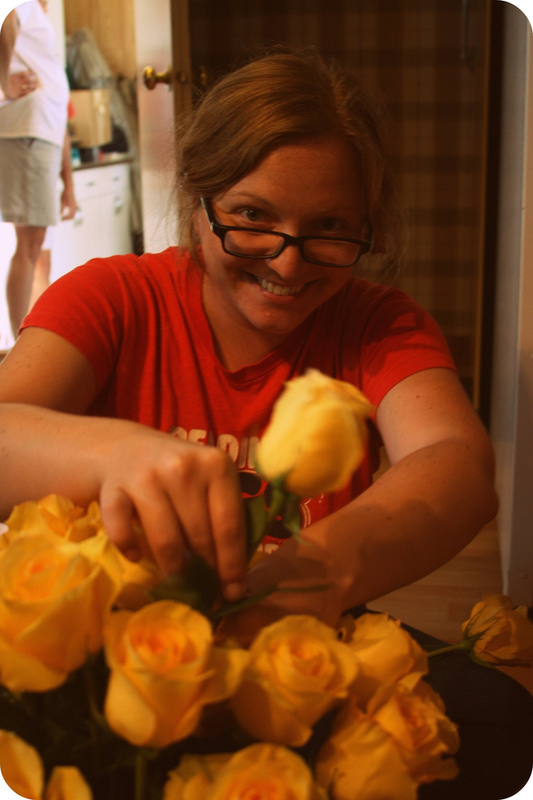 Andrea = domestic, crafty, flower-arranging rock star. Love this girl. Stay tuned for more pictures of the main event tomorrow! I’m sooooo excited about the food, which will be catered by Common Roots. 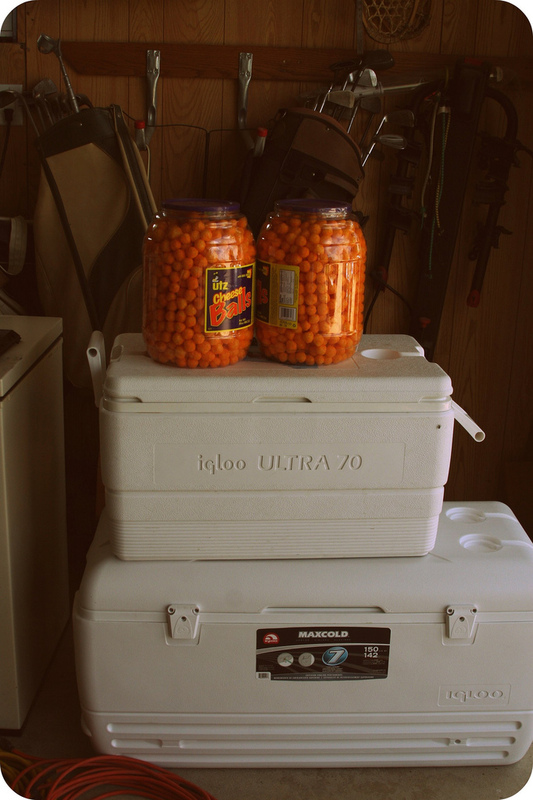 Also, I spied two huge things of Utz cheese balls for the after-party. Yums. Anyway, I’m a bit dead on my feet after a full day flower-ing, so I’m off to be spoiled by my big brother, who’s grilling us up some dinner at his house. I’ve still got to figure out what the heck I’m wearing to the wedding and make sure it’s cleaned, steamed and ready to go. Tomorrow’s going to be a long one, in the BEST possible way, so an early bedtime is in order. I hope you’ve had lovely Fridays! This entry was posted in Uncategorized and tagged good times by highplainsthrifter. Bookmark the permalink.